The object of the game is to empty your hand of cards before the other player (s) while also trying to capture certain scoring cards during play. Additional points may be earned by betting that you will be first to shed all of your cards. A Haggis deck consists of 54 playing cards, with ranks 2 through 10 in five suits, plus three Jacks, three Queens, and three Kings. There are also three Player Aid cards and this rules document included with the game. 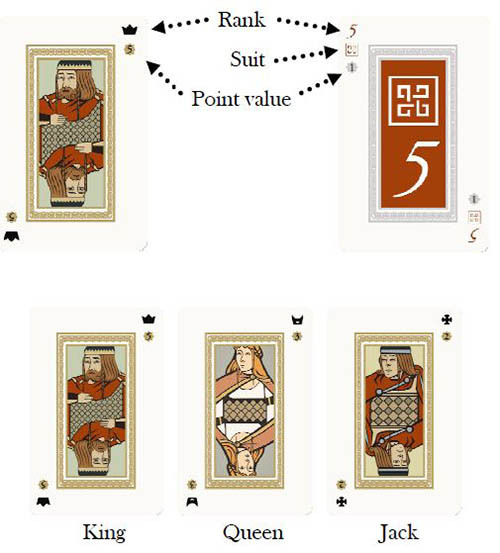 The playing cards rank, from low to high: 2, 3, 4, 5, 6, 7, 8, 9, 10, J, Q, K.
With two players, remove one complete suit, one Jack, one Queen, and one King from the deck before the game begins. A game of Haggis is played over several rounds (hands). For the first round, select one of the players to be dealer. Place one Jack, one Queen, and one King face-up in front of each player: these are wild cards. Shuffle the remaining cards and deal 14 face-down to each player. A player's hand consists of these 14 dealt cards which are picked up and held in hand plus the 3 wild cards which remain face-up on the table until played. The remaining cards (8 cards for 2 players, 3 cards for 3 players), the Haggis, are put aside without looking at them. Players may bet to be the first to "go out" (shed all cards from hand). A bet may be declared at any time before the player has played any cards. The player declares a bet for 0 points (No Bet), 15 points (Little Bet), or 30 points (Big Bet). All players may place bets. The bets do not have to be equal. Once placed a bet may not be retracted or altered. Each round is played over of a number of tricks. For the first round, the player to the dealer's left leads to the first trick by playing an opening card combination. A card combination may be a set, a sequence, or a bomb. A set is a group of cards of the same rank. Sets may consist of one to eight cards (singles, pairs, 3 of a kind, etc). A set may include any number of wild cards. A sequence (or run) is a group of three or more singles, or two or more larger sets (pairs, 3 of a kind, etc)., of consecutive rank sharing the same suit(s) between sets. The J, Q, or K may also be used as wild cards to stand for any lower ranked card(s) in a set or sequence. Example: a J can stand for an 8 but cannot be substituted for a K.
When played as part of a sequence, wild cards may have whichever suit is required. Note the J, Q, K do not have to be played as wild cards, they' can be played as singles, in a set or sequence. A Jack will beat a single 10; 9-10J will beat 8-9-10; 10-1OJ-Q (where the Jack, is "natural and the Q "wild ") can be played as a sequence to beat 9-9-10-10. When played as part of a larger combination (set or sequence), the combination must contain at least one non-wild card (otherwise the combination would be a bomb). 3-5-7-9 (these 4 ranks in one suit, no wild cards). After a combination of cards is led, play proceeds clockwise with each other player having the option to play a higher ranking combination or pass. Note that a player with a higher combination can choose to pass instead of playing it. A player without a higher combination must pass. To be higher ranking, the new combination must be of the exact same type, have the exact same number of cards, and have higher ranking cards. So if a single card is led, only a higher single card can be played; if a pair is led only a higher pair can be played; a three card sequence can only be beaten by a higher three card sequence; and so on. Bombs are the only exception to this rule. A bomb can be played, in turn order, to beat any combination except an equal or higher bomb. After a bomb has been played only a higher ranked bomb may be played. Players continue to play in this manner, playing successively higher combinations of the same size and type (or bombs) or passing until a combination is played and all of the other players pass in succession. In a two player game, the trick ends as soon as one player passes. In a three player game the trick ends as soon as two players pass in succession. A player that passes may still play until the trick ends. When the trick ends, the player who played the highest combination is the winner of the trick. If the highest combination played was not a bomb, the cards played to the trick are captured by the winner. If the trick was won by a bomb, the cards played to the trick are captured by one of the winner's opponents (the winner of the trick chooses which). Note: In three player tournament setting, instead of the winner deciding who captures the cards, a trick won by a bomb is captured by the player with the next highest combination played to the trick If a trick is won by a lead bomb, the trick is captured by the player to die light of the player that lead with a bomb. The winner of the trick leads the next trick. In a three player game, if the winner of the trick has gone out, the player to her left leads. When all but one player has shed the cards from her hand, the round is over. In a three player game, the first player to go out records the number of cards held by the opponent with the most cards before the remaining two players continue play. Remember, wild cards count as part of the hand. The last player to play a combination captures all cards played to the final trick (unless the last combination played was a bomb in which case the cards in the final trick are captured by an opponent, as detailed in Trick Play}. The final player does not get to play any more cards. 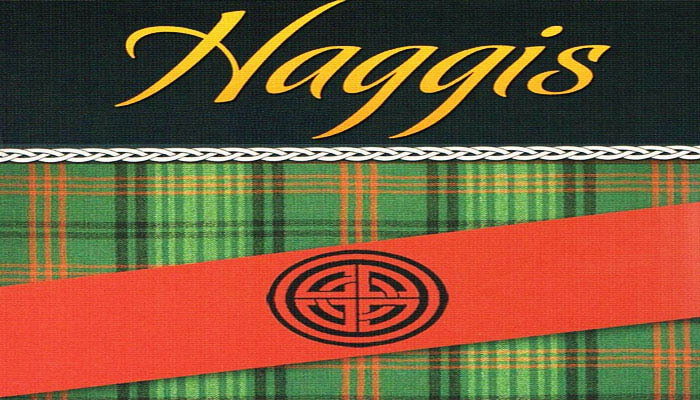 All cards remaining in the final player's hand and the Haggis are captured by the player who went out first. Remember to record the number of cards (including wild cards). Points are scored for 1) Cards left in your opponents' hand, 2) Points cards captured during trick play and 3) Bets. A player that goes out will score 5 points for each card in the hand of the opponent who held the most cards at the moment she shed her last card. Remember, wild cards count as part of the hand. 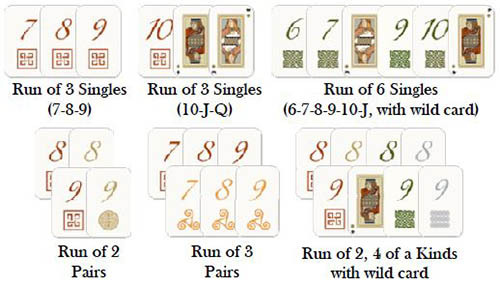 All point cards (i.e., any 3, 5, 7, 9, J, Q, or K), captured during trick play, score their point value for the capturing player. Points for any bets are scored. If the bet was successful, the amount bet will be added to the player's score. If the bet was not successful the amount bet will be added to the score of the player first to "go out" and any opponent that did not bet on this round. Adam, Brenda, and Carol are playing. Adam and Brenda both make Little Bets after receiving all of their cards. Carol does not bet. Adam goes out first Adam earns 15 points for his successful bet, plus 15 points for Brenda's unsuccessful bet, for a total of 30 points. Brenda does not earn any points from bets. Carol earns 15 points for Brenda's unsuccessful bet. In this same scenario, if Carol had gone out first instead of Adam, she would have earned 30 points, 15 for each of Adam and Brenda's unsuccessful bets, no other player would earn points from the bets. The dealer is the leader in points; if there is a tie, the winner of the last round deals. The player with the fewest points gets the first lead; if there is a tie, the player to the left of the dealer leads. Continue playing rounds until an agreed upon cumulative score is reached (or passed) by at least one player. The player with the most points wins. If the scores are tied, continue playing rounds until there is a winner. For a shorter game, 250 points is suggested. For a longer game, 350 points is suggested.